Hey guys! Ashley here with Toasty Tribe to bring you another totally fun and totally free knitting pattern!! If you follow me on Instagram, you’ll know that I’ve been a little obsessed with socks lately. In my opinion, they are kind of the best project to have on your needles. They don’t take very much yarn, (can you say stash-buster??) 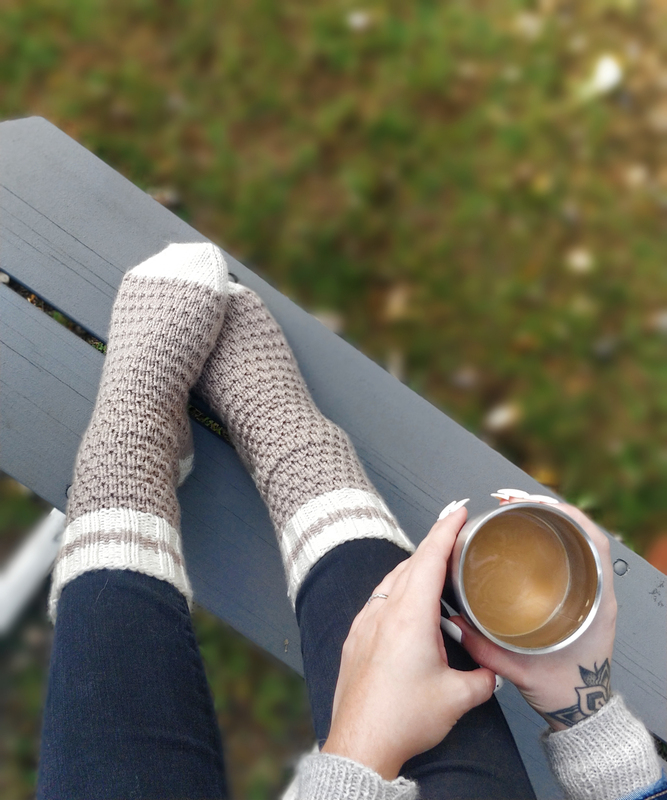 they are a small project that can fit easily in your purse, they are a quick knit, and socks are something that you can wear almost all year round! Okay, are you convinced yet? Let me introduce you to the Snowed-In Socks! 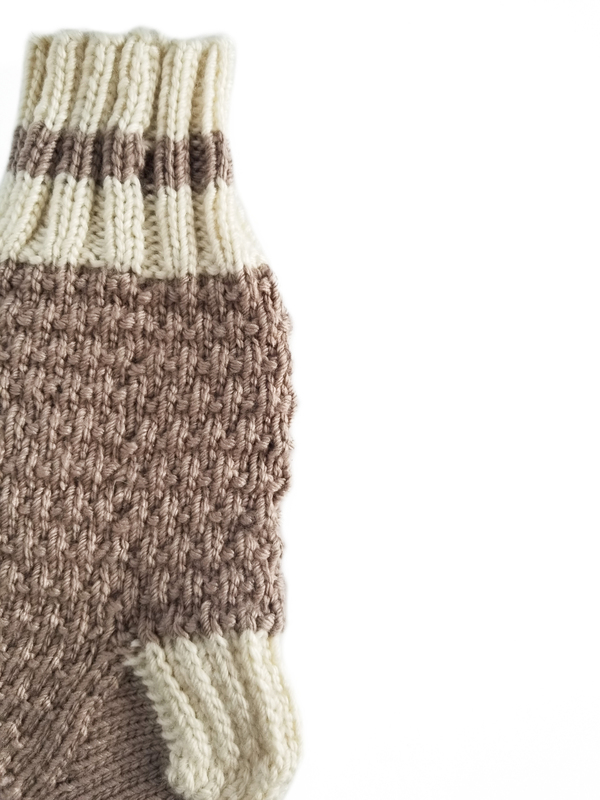 The perfect chunky knit socks to cuddle up with when you just don’t want to go outside. It may not have snowed yet here in Wisconsin, but now I am so ready for when it does. Everyone has that favorite pair of cozy socks that they throw on when it starts to get chilly, and these are about to be your new favorites! They have an easy to follow textured design (prime for knitflixing), are knit in two contrasting colors, and have two different sizing options: S/M and M/L. 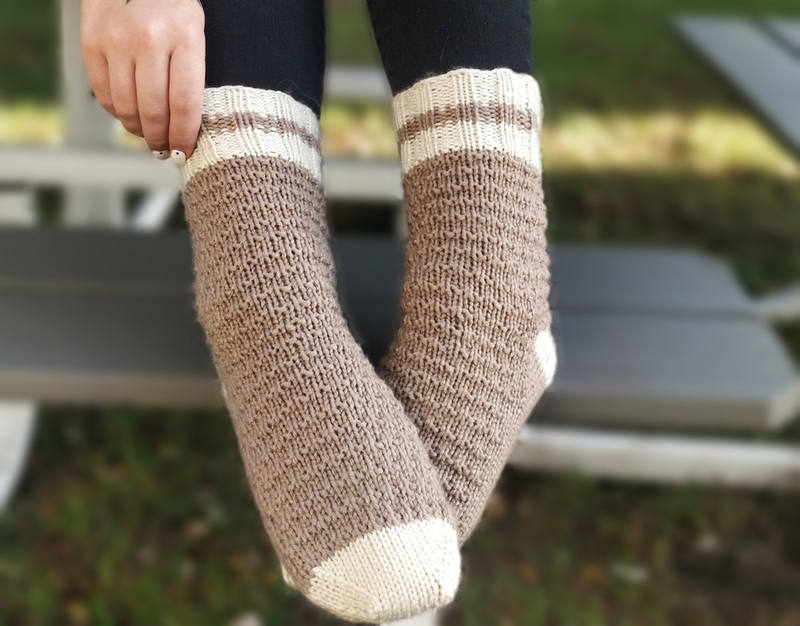 This is not a beginner pattern, but it is a great pattern for your first pair of socks. You will need to know how to: Switch colors, knit with magic loop, divide stitches, pick up stitches, and kitchener stitch. If you don’t know some of these techniques, YouTube is your BEST friend. Its where I have learned almost everything I know about knitting! Alright, lets get started! - Instructions are given for the smaller size and the larger size in parenthesis. When only one set of instructions is given, it applies to both sizes. Rep Rows 1-8 four more times or until desired length, ending on row 8. Divide stitches in half and use 22 (24) sts for heel. Begin by working backwards on wrong side. Rep rows 1-2 until you have 9 (11) garter edge stitches on each side. Row 3- Sl 1, P to 1st stitch b4 gap, P2tog across gap, P1, Turn work. Rep rows 3 and 4 until all heel stitches have been worked, ending on row 4 and with 14 heel sts. Pick up and knit 9 (11) sts, along the heel flap edge. Pick up and knit 2 extra stitches between the heel flap and instep to close the gap. Place sts marker. Knit in pattern the first 11,(12)sts, this is now Needle 1. Using the other needle (needle 2 if using magic loop) knit in pattern the next 11 (12)sts. Place a marker. Pick up and knit two extra stitches to close the gap. Pick up and knit 9, (11)sts along the heel flap edge. Knit 7 heel stitches. This is now Needle 2. -You now have 58, (64) sts total: 29, (32) on each needle. Row 1- (needle 1) Knit to 2sts before marker, SSK, Knit in pattern across instep till end. Row 1- (needle 2) Knit in pattern across instep till marker, K2tog, Knit till end. Row 2- (needle 1) Knit to 3sts before marker, K2tog, K1, Continue in pattern across instep till end of needle. Row 2- (needle 2) Continue in pattern till marker, K1, SSK, Knit till end of needle. Row 3- Knit in pattern across instep and knit stockinette for sole. Rep rounds 2 and 3 until there are 44,(48)sts remaining. 22, (24) on each needle. Continue knitting the instep stitches in pattern and the sole stitches in stockinette until the foot is 1.5, (2) inches shorter than your desired finished length (or depending on the amount of negative ease you prefer). K1 all around for one row. Row 1- *K1, SSK, K to last 3sts, K2tog, K1* repeat this same sequence on the back needle. Row 2- Knit all around on both needles. Repeat Rows 1 and 2 until there are 20, (24,)sts left. 10, (12)sts on each needle. Make sure to end on a Row 2. Cut 10" tail and use kitchener stitch to finish the toe. Make another, and now you’ve got a pair!!! 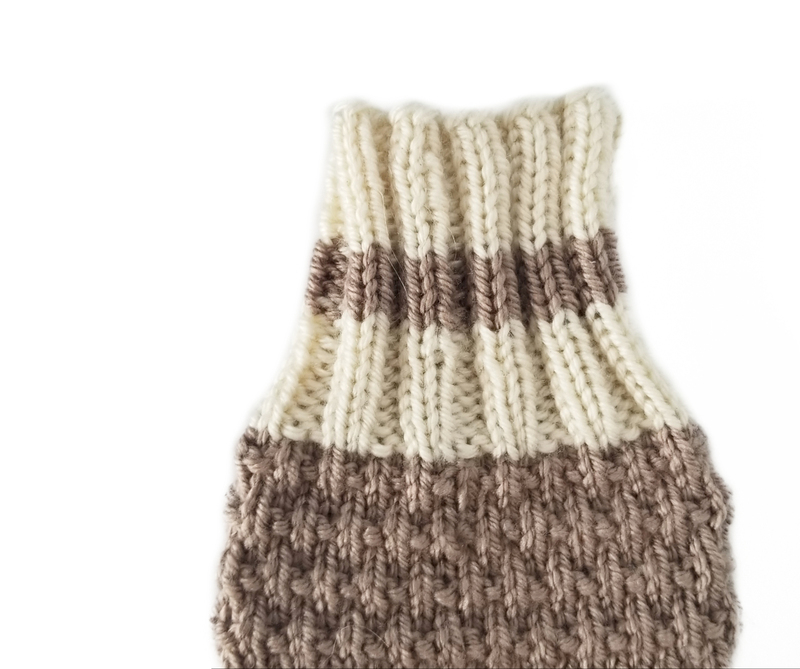 I hope you enjoyed this pattern, and that I was able to convert you to a diehard sock knitter! Don’t forget to share and tag me in Instagram @toastytribehandmades, I cannot wait to see your creations! You can find more of my work on Etsy and on Ravelry.